Exquisite Collections of Chinese Textiles & Jade Lead Skinner’s Asian Works of Art Auction, March 18 | Skinner Inc.
♦ Embroidered Lady’s Informal Robe, 19th century, pale blue silk richly embroidered with flowers, fruit and auspicious symbols (Lot 119, $2,000-3,000). ♦ Official Canopy Cover, 18th-19th century, with embroidered motifs of a pair of lung dragons, each chasing a pearl (Lot 140, $3,000-5,000). ♦ Yunjin brocade yardage, featuring intricate woven patterns of dragons, clouds, and other traditional motifs. (Lots 143-145, $5,000-7,000 each). The skills that produced such remarkable textiles are being lost and the labor-intensive techniques are dying out, says Judith Dowling, Director of Asian Works of Art. 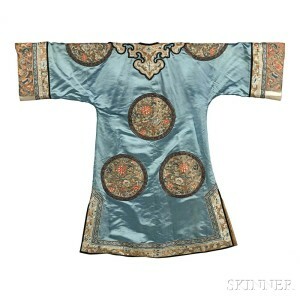 This decline is stimulating interest in these needlework treasures, both in China and among collectors around the world. 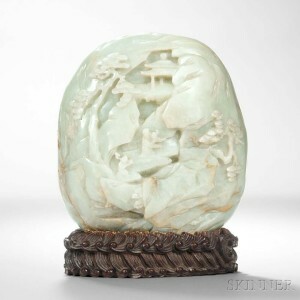 Carved jade is perhaps China’s most admired artifact. This auction includes numerous examples of the revered mineral, including a significant collection of small jades from the estate of a connoisseur who began his acquisitions many years ago. ♦ Jade Boulder, 18th century. An impressive 9 ¾ inches high, the piece is finely carved with two figures amid mountain scenery (Lot 202, $60,000-80,000). ♦ Jade ruyi Scepter, a gnarly branch embellished with mushrooms and a hornless dragon (Lot 232, $10,000-12,000). 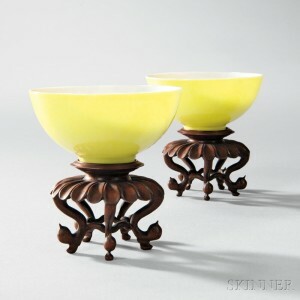 ♦ Pair of Lemon yellow-Glazed Wine Cups, 1723-35. They are very early, very small, and very fine. The brilliant color is hard to achieve, and firing such delicate objects is a great technical accomplishment (Lot 281, $30,000-50,000). ♦ Peachbloom Water Coupe, 18th century, with incised underglaze decoration of dragons (Lot 282, $10,000-20,000). ♦ Hanging Scroll Calligraphy by Wu Changshuo (Lot 432, $40,000-60,000). ♦ Mountain-Water by Zhang Daquian, ink and light color on paper (Lot 442, $50,000-70,000). Also offered are a variety of Japanese woodblocks including several Kawase Hasui works noted for the delicately atmospheric depiction of landscapes and cityscapes in snow and rain. Like his library, Joseph Wei was a person of many interests, with great depth of knowledge–his life’s study focused on the worlds of Asia and the Middle East. He combined his connoisseurship of Asian art with a career as a fine arts dealer, all the while following a spiritual journey that embraced Christianity and Buddhism. 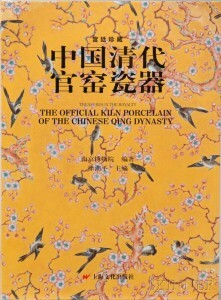 His library contains both scholarly monographs, particularly rich in Buddhist material, and titles essential for the study and authentication of works of art. Highlights from his collection will be offered in the March 18 auction. Additional rare and desirable titles will be available in the online-only auction, A Scholar’s Library, from March 9 – 20. Previews will be held on Thursday, March 16, 12-5PM; Friday, March 17, 12-7PM; and Saturday, March 18, 9-10:30AM. This entry was posted in News and tagged asia week, asian art, asian art auction, asian works of art, boston, China, Chinese art, Chinese books, Chinese ceramics, Chinese painting, Chinese textiles, jade, Japan, Japanese art, Japanese print, Joseph Wei, Judith Dowling, Korea, Live Auction, netsuke, scroll paintings, skinner, skinner auctions, woodblock print, Yunjin brocade by Skinner. Bookmark the permalink.